Free update brings new missions and extra content for bus drivers! Moenchengladbach/Germany, August 16, 2018 – astragon Entertainment GmbH and the stillalive studios developer team are happy to announce the release of the newest update for Bus Simulator 18 today. Virtual bus drivers can now look forward to an extensive package of brand new challenging missions. After focusing on general game improvements and free content such as the License Plate Generator and the Country Skin & Decal Pack DLC for the Bus Simulator 18, the stillalive studios developer team now comes up with the next big surprise for the Bus Simulator 18 community: The brand new Mission Pack # 1 offers a whole set of new missions for advanced bus drivers! Just like in the previous missions, the new tasks are charmingly synchronized by professional voice actors. 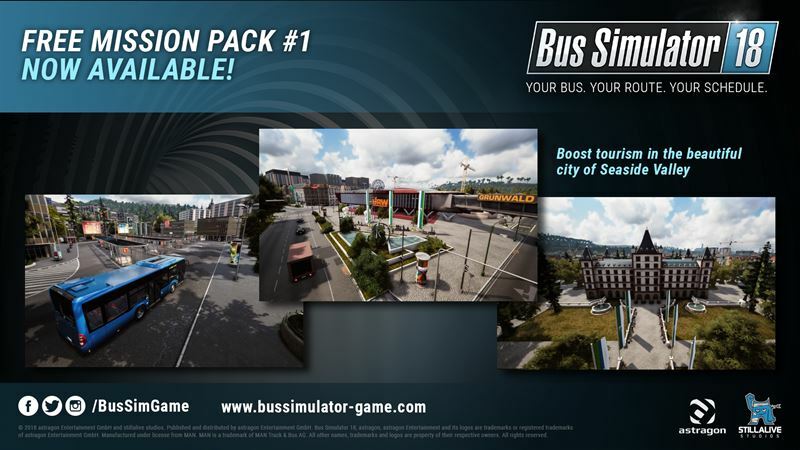 The Mission Pack # 1 expands Bus Simulator 18 by three brand new missions, along with a number of challenging sub-tasks that focus on boosting tourism in the city. In addition to special points of interest and hiking tourism, the nightlife of Seaside Valley plays a crucial role, too. As a reward for fulfilling the new tasks players can look forward to three brand-new decals, a complete bus skin and numerous new colors to customize their bus fleet. Bus Simulator 18 for PC is available at a price of 29.99 Euro, 34.99 USD, 26.99 GBP in retail and digital stores. The new Mission Pack # 1 update is now available as a free download for owners of the main game on Steam™.